Once your baby has crossed that 6 month mark, you might have just started solid food for him/her or are now starting. Whatever is the case, it is important to go slow and follow baby’s lead. For 6 months old baby, we start with very dilute purees and gradually thicken them as baby gets used to it. We also follow the 3 day wait rule whenever introducing any new food to baby. Even though there are different opinions on the need to follow 3-day wait rule, it makes sense to me personally. Introduce very little at first and be on the lookout for any rashes or allergy. What 3 day wait rule basically means is that you should wait for 2 to 3 days whenever you start giving a new food item to your baby, before introducing another new item. It makes sense, because this means you can keep an eye on baby and be sure that the newly introduced item has not caused any allergy/ reaction, diarrhoea, constipation etc. So, if you introduce banana puree on day 1, you should continue it for next 3 days, before introducing next item which is say apple puree. Once you know it is safe, then you can then mix it with say rice cereal. 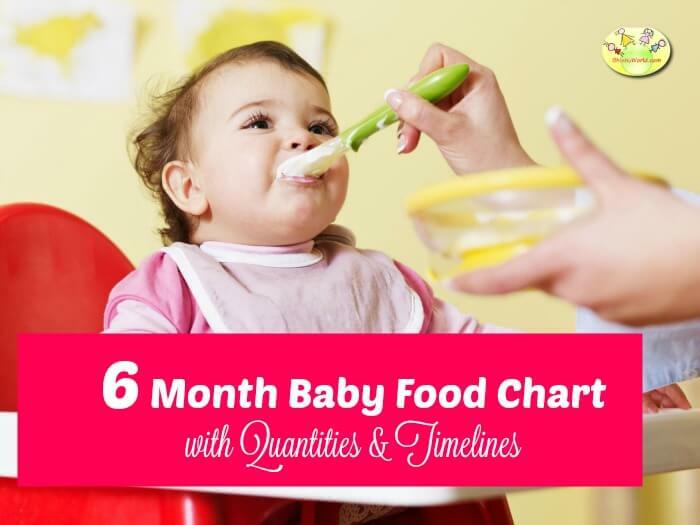 Here we suggest a month-wise feed chart/ timetable for babies beginning from 6 months, right upto to 2 years toddler food chart. Check out our popular and comprehensive Food chart for Babies for babies between 0-12 months. You can easily change/modify /avoid any items according to your convenience and your baby’s preference. Not all babies will be having two solid meals a day at this stage. Start with very little once a day and gradually increase it over next few weeks. The plan lists solid external food. Please remember that breast milk or formula forms most important part of baby’s diet during the first year. Continue to breastfeed or formula-feed in between meals as and when required. Mixed feeding: Is it OK to combine breastmilk & Formula? If you follow this schedule, we suggest starting with applesauce during morning and continuing with it for next 3 days. Give only 1-2 teaspoons of apple sauce or any other food that you introduce at this point. Remember that this is only to get the baby used to solid texture and nutrition needs are still fulfilled by breastmilk or formula. After 3 days, you may give mashed/ pureed banana for 3 days and then suji halwa. Follow our recipe to see how to make suji halwa without sugar. Do not cut back on breastmilk or formula as it is still the main source of nutrition for baby. Below are the recommended timings that you may follow for your baby. Again, every baby is different, so feel free to suit your and your baby’s needs. Some babies may need more than 2 naps while other may not be ready to sleep by 9:00 pm. These are perfectly normal as long as baby is healthy and happy. Thank you for this chart. My baby is 6 months old and I was looking for a food chart for him. This will help me in introducing solids to him. Can you also advise some recipes for weaning. Thanks for your appreciation. You can check out these below, weaning recipes for babies. This is lovely initiative from you,Priya.I’m sure so many new mothers have no idea of how to start solids for their 6 month old,especially those like me who stay away from family and have no one as such to guide.For my little one, I had started off by giving a spoon of ragi porridge for breakfast.She refused to eat initially but gradually developed taste.I added a pinch of jaggery to it for her to like.